Heat oven to 350°F. Line 2 large cookie sheets with cooking parchment paper. Remove tea leaves from bag; discard bag. In large bowl, mix tea leaves, cookie mix, 1 teaspoon of the cinnamon, the ginger, 1/4 teaspoon of the cardamom, the allspice, softened butter and egg until soft dough forms. Shape dough into 30 (1-inch) balls. In small bowl, stir sugar with remaining 1/2 teaspoon cinnamon and 1/8 teaspoon cardamom until combined. Roll balls in sugar-spice mixture; place about 2 inches apart on cookie sheets. Bake 10 to 12 minutes or until light golden brown. 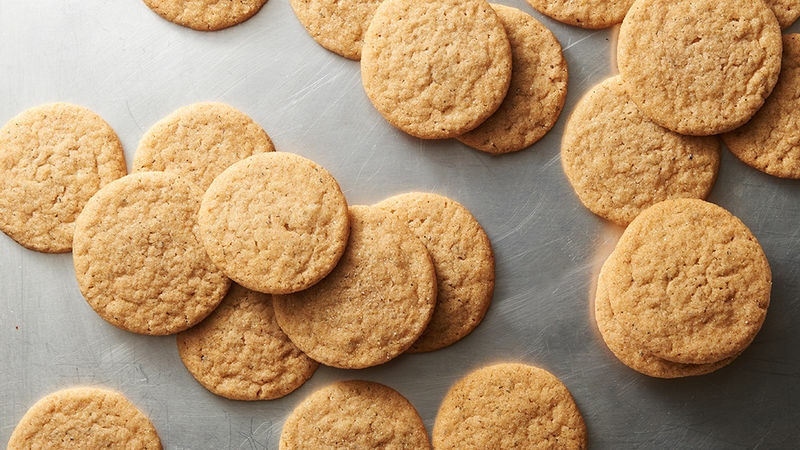 Cool 1 minute; remove cookies to cooling racks to cool completely. Store in airtight container at room temperature up to 3 days. Any tea bag labeled “black chai tea” will work for this recipe. Double this recipe, and use it for a holiday cookie exchange!